of their windowless isolation module. In a longest ever space simulation, an international crew of researchers on Friday came out of the set after a long 520 days simulation of a flight to Mars in Moscow. 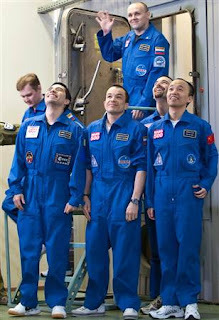 Among the international crew, three were Russians, one from France, one Italian-Colombian and one was fro China. The simulation was to study the confinement, stress and fatigue while travelling from one planet to another. Psychologists who were studying the test from outside said long confinement has put the team member under stress as they grew increasingly tired of each other’s company. Saying that real flight would be more interesting as they will get a complete different experience on board. The crew showed signs of fatigue but no signs of stress as they walked to microphones to speak before cameras. “We hope that we can help in designing the future missions to Mars,” Frenchman Romain Charles said with a smile. During the whole mission which cost $15 million, the crew could communicate to their organizers and family members only via Internet. The Internet was purposely made slow and delayed occasionally to imitate the effects of space travel. They had canned food similar to what is offered on International Space Station. Organizers of the experiment at Moscow’s Institute for Biomedical Problems said, that the crew will undergo a series of medical checkup to ensure the noise and life of the city doesn’t affect them which was not present in their metal walled habitat. “Time seems to have flown by since we closed the hatch last year. But how time really felt to the crew we’ll soon know. Probably we’ll have a very big difference of opinion,” said the head of the institute, Igor Ushakov. A real flight to Mars seems decades far away, as it involves huge cost and technological challenges, specially the task of creating a lightweight compact shield to protect the crew from the space radiations, NASA is aiming to land their mission on a nearby asteroid in 2025 and then on Mars in 2030. Whereas Russian space agency said that with the help of this experiment, they can pave way for a real Mars expedition until the mid-2030s and that too with close international cooperation.